Noel has this thing for shucking on paper. When you go to take a tissue from the box, or a napkin from the table, you may find the edges twirled with spit, or chewed off all together. At holiday time, we have to hide the wrapping paper. Peanut says that if Noel were a person, she would have the disorder called: Pica. That is the persistent eating of substances such as dirt or paint that have no nutritional value. 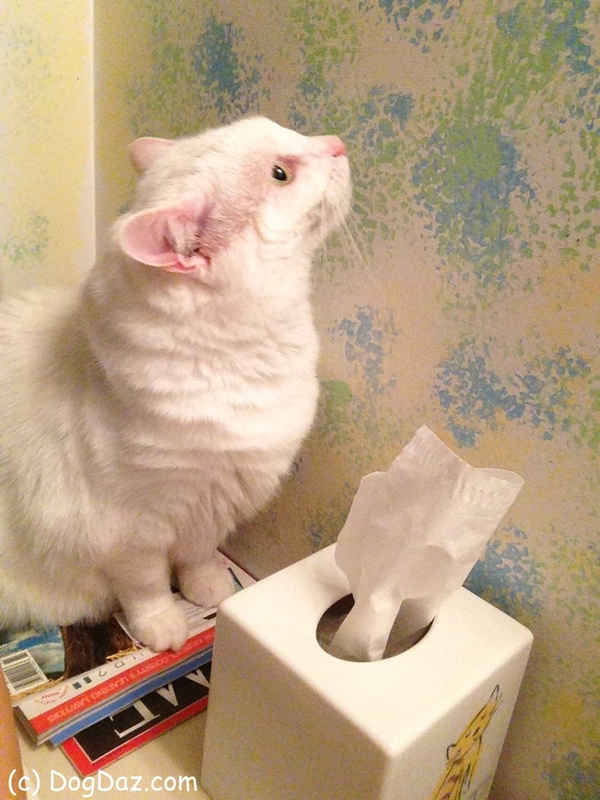 Actually, that may describe most of my animals, but Noel is really into paper. Do your furries eat stuff like this? I do the papers too :o) and tissues make a great base for the other things what land in my stomachs :o) Have a super caturday! Oh I understand now. It’s for roughage. Paper is delicious. Especially napkins with a hint of food smell on them. Yum! I understand napkins and dogs, since I know many napkin thieves, but not cats.